With hundreds of options to choose from, it can be difficult to pick out the best California Chardonnay wines. Find out what to look for in a great bottle. Since the middle of the 1800s, northern California has been famous for its ability to grow world-class grapes for winemaking. The climate and soil of areas like Napa Valley and Sonoma County are ideally suited to winemaking, and since the 1940s and 1950s, this region has been producing some excellent Chardonnays. 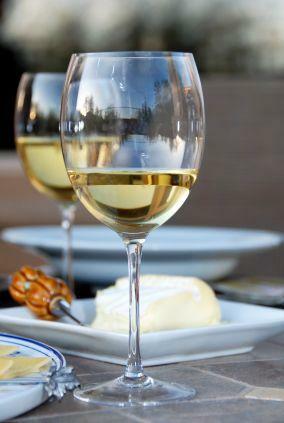 Chardonnay, a clean-tasting, dry white wine, is the most popular wine in America. This versatile beverage goes well with a variety of dishes, from salmon to pasta, and it's on the menu in most restaurants. Most of America's Chardonnay wines come from California. In fact, industry experts say California-grown Chardonnay accounts for a third of the wine purchased in the United States. One reason for the popularity of California Chardonnay may be its affordability, but the low price has also created a backlash. About 90 percent of Chardonnay bottles carry a price tag of under $10, making it easy to buy a decent California Chardonnay without breaking the bank. However, in the mid-1990s, Chardonnay began to go out of fashion, partly because its affordability made it seem less special to consumers. The popularity has fluctuated over the years, but today, Chardonnay sales are holding steady. The term "estate" means that the wine was made from grapes grown on the vineyard, rather than purchased grapes grown in various conditions. The name of a specific county or region, rather than just "California," indicates that the wine is higher-quality. Bottles that are labeled with the vineyard's name also indicate a higher-quality choice. Some wineries consistently produce great Chardonnays. While the wine will change from year to year, you can be assured of a good bottle if you stick with a winery that has a great reputation. Hyde Vineyards - Since 1979, this winery has been producing great California wines, including many notable Chardonnays. Stony Hill Vineyard - For more than half a century, this California winery has been specializing in Chardonnays. Mount Eden Vineyards - This wine estate has been producing a variety of California wines, including Chardonnay, since 1945. Chalk Hill Vineyards - Specializing in estate wines, this vineyard has a reputation for producing remarkable Chardonnays. Kendall-Jackson Wine Estates - As the producer of one the most affordable quality Chardonnays, Kendall-Jackson is a good choice if you're on a budget. La Crema Winery - For more than 30 years, La Crema has been making intense and well-respected Chardonnay wines. Regardless of which California Chardonnay you select, you can expect a beverage that will complement a wide variety of meals and please most palates.